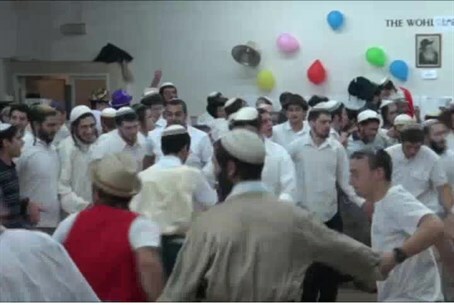 Watch celebrations of Purim in Jerusalem’s Merkaz Harav yeshiva. Residents of Jerusalem are celebrating the holiday of Purim on Monday. While most of the country celebrated Sunday, in Jerusalem the holiday is held one day later, in commemoration of the fact that Jews living in walled cities at the time of the Purim miracle fought their enemies for one extra day. Among the celebrations, Sunday evening, was a central event at the Merkaz Harav yeshiva in the city. MK Yoni Chetboun (Jewish Home) can be seen carried on one of the dancer's shoulders.